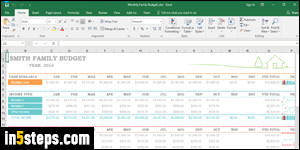 A spreadsheet program like Excel is the best tool to keep track of your income, bills, and other expenses. For as long as I can remember, Microsoft offered free templates on its website for all apps in the Office family. But recent versions integrate templates even more tightly, and they're easier to download. This tutorial uses Excel 2016, but the steps are the same in Excel 2013 / 2010. 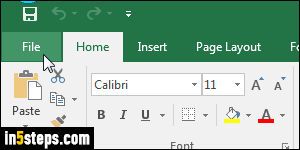 Once in Excel, click on the File button (top left corner), and select "New" on the left. The Backstage view shows a list of popular templates, including a blank workbook. 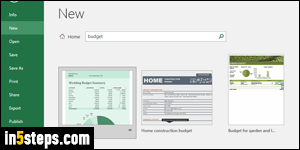 Type "budget" in the search box at the top, and hit Enter. 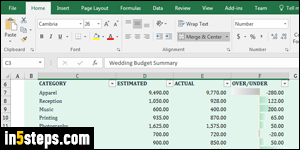 You can preview each template, and notice that many of them are specialized for special occasions: wedding budget, college budget, etc. I'll choose the most generic one, called "Monthly Family Budget". If you like it, just search for that exact term and you'll find it. Tip: notice that when you move your mouse over any template in the results, a pin icon appears: clicking on it adds that particular template to the list Excel so that it stays permanently in the Backstage view! Within seconds, Excel will download and open the template you selected. Start by clicking on the Save button (or hitting the Ctrl+S keyboard shortcut) to save that file on your computer: the file only exists in memory until you do. Using a template means that everything's already formatted, and that the formulas have already been created. The downside is the sample data that is often included. 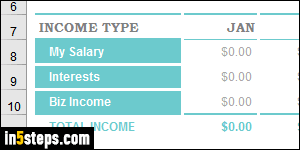 You can manually set these values to zero (where applicable), and rename the header names for your own use (like "My Salary" instead of "Income 1"). Once your budget template ready to use, save it and mark it as read-only so that you don't accidentally overwrite the "blank" template!